Alzheimer’s disease (AD) is a progressive and irreversible, degenerative, fatal disease and is the most common form of dementia among older people. Dementia is a brain disorder that seriously affects a person’s ability to carry out daily activities. It usually begins after age 60 and the risk goes up as you get older. Risk is also higher if a family member has the disease. Progression of the disease is done in phases until all cognitive function is destroyed. Pathologic consequences include the loss of neurons in multiple areas within the brain, atrophy with wide sulci and dilated ventricles of the brain, the presence of plaques composed of neurites, astrocytes, and glial cells that surround an amyloid center, and neurofibrillary tangles. Symptoms seen in AD are the result of the destruction of numerous neurons in the hippocampus and the cerebral cortex. The enzyme choline acetyltransferase, has a decreased action with AD patients, which results in impaired conduction of impulses between the nerve cells caused by lack of acetylcholine production. Currently, no treatment can stop the progression of the disease. However, some drugs may help keep symptoms from getting worse for a limited time. 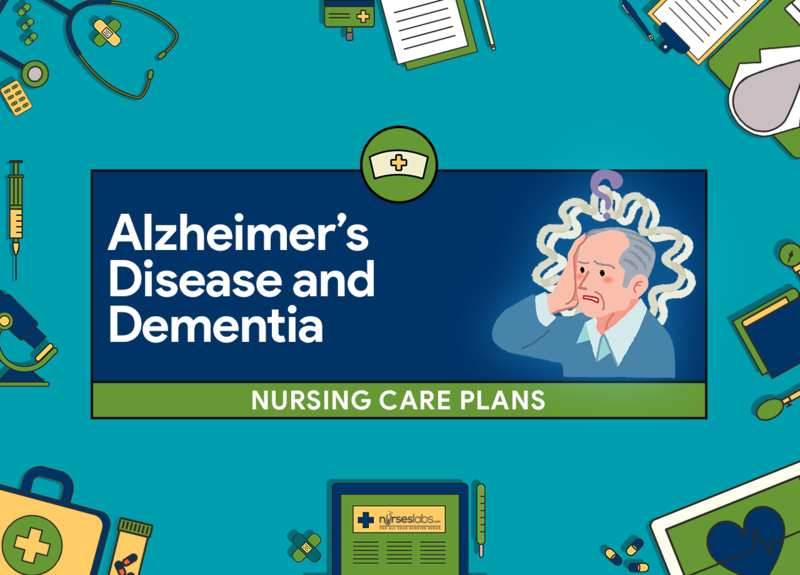 Nurses play a key role in the recognition of dementia among hospitalized elderly, by assessing for signs during the nursing admission assessment. Interventions for dementia are aimed at promoting patient function and independence for as long as possible. Other important goals include promoting the patient’s safety, independence in self-care activities, reducing anxiety and agitation, improving communication, providing for socialization and intimacy, adequate nutrition and supporting and educating the family caregivers. Assess patient’s ability for thought processing every shift. Observe patient for cognitive functioning, memory changes, disorientation, difficulty with communication, or changes in thinking patterns. Changes in status may indicate progression of deterioration or improvement in condition. Assess the level of cognitive disorders such as change to orientation to people, places and times, range, attention, thinking skills. Provide the basis for the evaluation or comparison that will come, and influencing the choice of intervention. Assess level of confusion and disorientation. Confusion may range from slight disorientation to agitation and may develop over a short period of time or slowly over several months. May indicate effectiveness of treatment or decline in condition. Assess patient’s ability to cope with events, interests in surroundings and activity, motivation, and changes in memory pattern. The elderly may have a decrease in memory for more recent events and more active memory for past events and more active memory for past events and reminisce about the pleasant ones. Patient may exhibit assertiveness or aggressiveness to compensate for feelings of insecurity, or develop more narrowed interests and have difficulty accepting changes in lifestyle. Orient patient to environment as needed, if patient’s short term memory is intact. Using of calendars, radio, newspapers, television and so forth, are also appropriate. Reality orientation techniques help improve patient’s awareness of self and environment only for patients with confusion related to delirium or with depression. Depending on the stage of AD, it may be reassuring for patients in the very early states who are aware that they are losing their sense of reality, but it does not work when dementia becomes irreversible because the patient can no longer understand reality. Television and radio programs may be overstimulating and may increase agitation, and can be disorientating to patients who cannot make a distinction between reality and fantasy or what they may view on television. Assess patient for sensory deprivation, concurrent use of CNS drugs, poor nutrition, dehydration, infection, or other concomitant disease processes. May cause confusion and change in mental status. Maintain a regular daily schedule routine to prevent problems that may result from thirst, hunger, lack of sleep, or inadequate exercise. If the needs of a patient with AD are not met, it may cause the patient to become agitated and anxious. Predictable behavior is less threatening to the patient and does not tax limited ability to function with ADLs. Allow patient the freedom to sit in a chair near the window, utilize books and magazines as desired. Validates patient’s sense of reality and assists the patient in differentiating between day and night. Respect for the patient’s personal space allows patient to exert some control. Label drawers, use written reminders notes, pictures, or color-coding articles to assist patients. Assists patient’s memory by use of reminders of what to do and location of articles. Allow hoarding and wandering in a controlled environment, as appropriate or within acceptable limitations. Increases patient’s security and decreases hostility and agitation by permitting behaviors that are difficulty to prevent, to be allowed within the confines of a safe supervised environment. Provide positive reinforcement and feedback for positive behaviors. Promotes patient confidence and reinforces progress. Limit decisions that patient makes. Be supportive and convey warmth and concern when communicating with the patient. Patient may be unable to make even the simplest choice decisions and this will result in frustration and distraction. By avoiding this, the patient has an increased feeling of security. Patients frequently have feelings of loneliness, isolation and depression, and they respond positively to a smile, friendly voice, and gentle touch. Provide opportunity for social interaction, but to do not force interaction. Helps prevent isolation. Forcing interaction usually results in confusion, agitation, and hostility. Inform patient of care to be done, with one instruction at a time. Patients with AD require extended time for processing information. Removal of decision making may facilitate improved compliance and feelings of security. Maintain a nice quiet neighborhood. Noise, crowds, the crowds are usually the excessive sensory neurons and can increase interference. Instruct family in methods to use with communication with patient: listen carefully, listen to stories even if they’ve heard them many times previously, and to avoid asking questions that the patient may not be able to answer. Comments from the patients may involve reliving experiences from previous years and may be totally appropriate within that context. In early stages of AD, questions may cause embarrassment and frustration when the patient is presented with another reminder that abilities are decreasing. Instruct family members in the disease process, what can be expected, and assist with providing a list of community resources for support. Once diagnosis of AD is made, the family should be prepared to make long-term plans in order to discuss problems before they arise. Choices for resuscitation, legal competency and guardianship including financial responsibility needed to be addressed The care of a person with AD is expensive and time-consuming, as well as energy-draining and emotionally devastating for the family. Community resources can help delay the need for placement in a long-term care facility and may help defray some costs. Face-to-face when talking with patients. Cause concern, especially in people with perceptual disorders. Call patient by name. The name is a form of self-identity and lead to recognition of reality and the individual. Use a rather low voice and spoke slowly in patients. Increasing the possibility of understanding. Assess the degree of impaired ability of competence, emergence of impulsive behavior, and a decrease in visual perception. Impairment of visual perception increase the risk of falling. Identify potential risks in the environment and heighten awareness so that caregivers more aware of the danger. Help the people closest to identify the risk of hazards that may arise. An impaired cognitive and perceptual disorders are beginning to experience the trauma as a result of the inability to take responsibility for basic security capabilities, or evaluating a particular situation. Eliminate or minimize sources of hazards in the environment Maintain security by avoiding a confrontation that could improve the behavior or increase the risk for injury. Divert attention to a client when agitated or dangerous behaviors like getting out of bed by climbing the fence bed. To promote safety and prevent risk for injury.